October 28, 2013 – The Dressage Foundation is proud to announce that Kathleen Raine (CA) is the first recipient of the Patsy Albers Award, established in 2012 in special remembrance of Patsy. The $500 award provides financial support for continuing education and training to a High Performance rider. Kathleen Raine of Murrieta, CA, is a Grand Prix competitor riding Breanna, a 13-year-old Hanoverian mare. 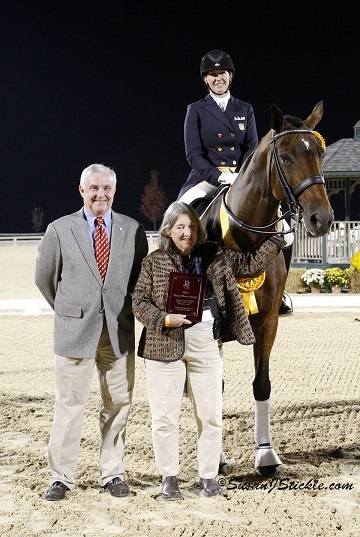 Kathleen placed third in the Grand Prix Division at the USEF High Performance Championships held at the Festival of Champions on October 8-12, 2013. She received the award because she was the highest placing Grand Prix rider who also competed for the U.S. at a previous North American Junior/Young Rider Championship. Above: TDF Board member Joseph Carr and Fund Creator Janine Malone present the Patsy Albers Award to Kathleen Raine and Breanna. Photo by Susan J. Stickle. For more information about the Patsy Albers Award or The Dressage Foundation, please contact Jenny Johnson at (402) 434-8585, by email at jenny@dressagefoundation.org, or visit www.dressagefoundation.org.